Guess today is an unintentional 2-for, as I posted the Christmas Cake last night around 10, and it was already today on server time. I am now convinced the server must be out in the middle of the Atlantic Ocean somewhere, since I am so far behind server time! It’s still cold. Amazing in Texas to have the same kind of temperatures for 4 or 5 days, but the sun is back, so doubtless it will warm up soon. Let’s hear it for the comfort food! 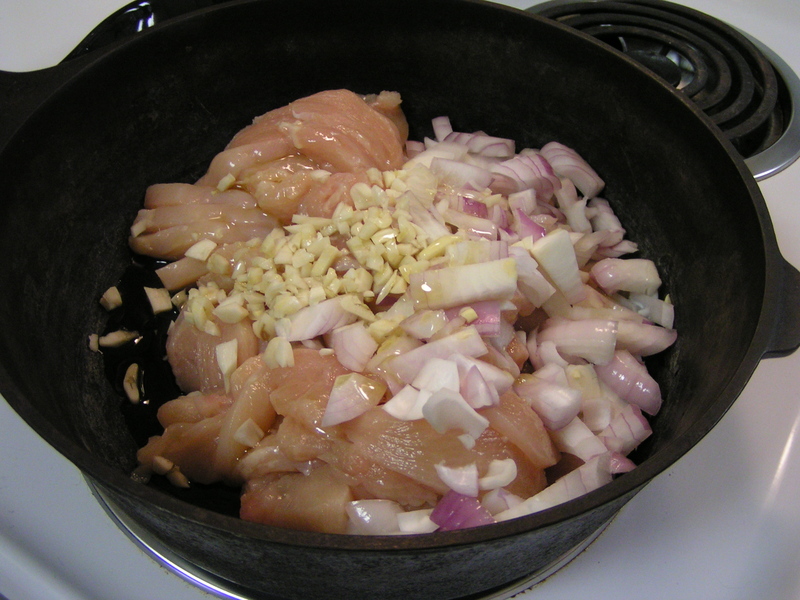 Slice boneless, skinless chicken breasts into thin, about 1 inch pieces, and brown with garlic, onion and celery. Brown in a skillet with a bit of olive oil. I used the Dutch oven, as I was planning to finish this off in the oven. 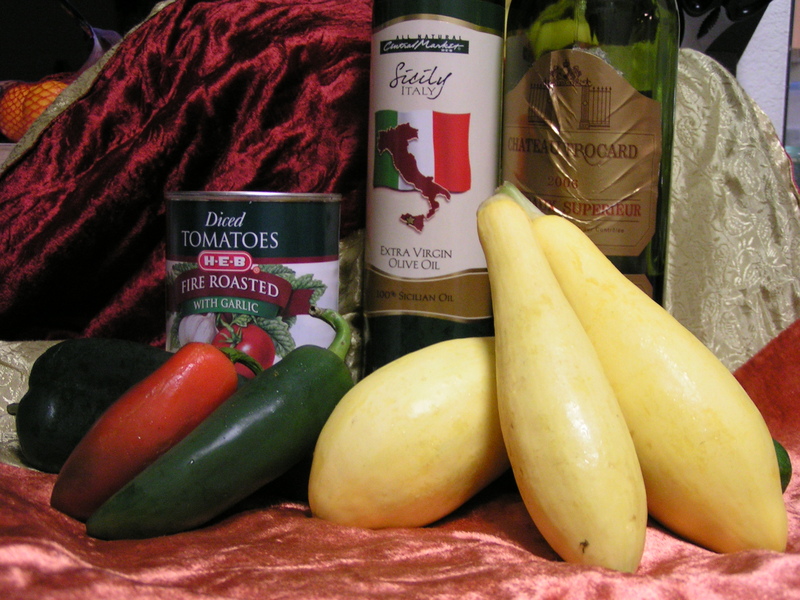 The cast of players tonight, include squash (of course), tomato, and chicken. 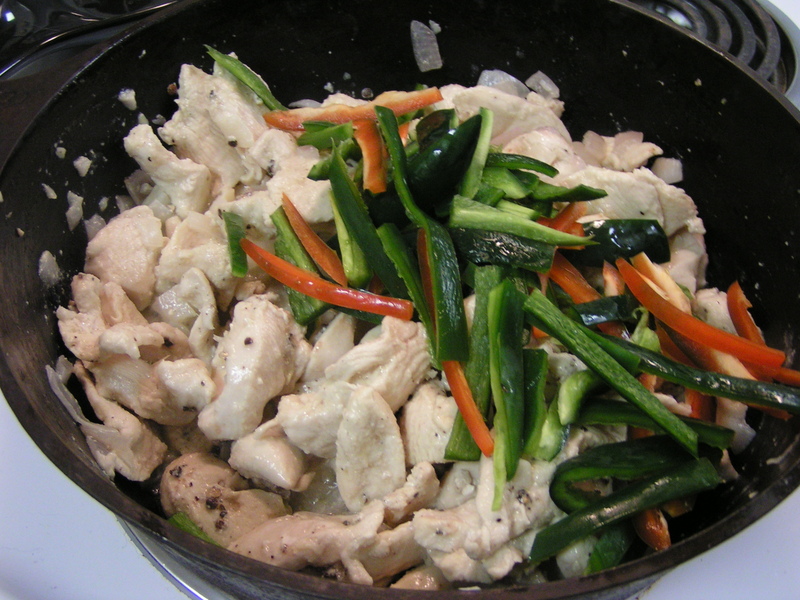 Thinly slice the chicken, and brown in olive oil with diced garlic, onion, and celery. 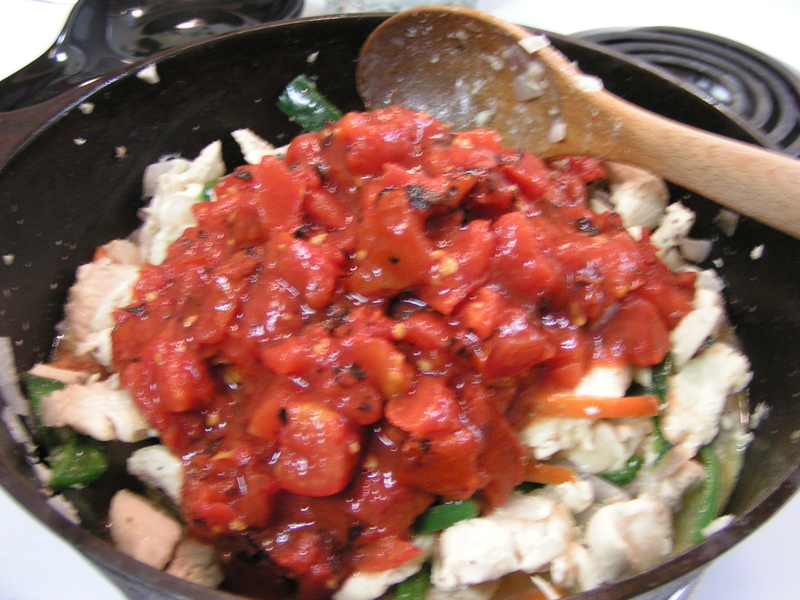 I used 3 cippolini onions I happened to have on hand for a sweeter flavor, but really couldn’t tell the difference when everything is smothered in tomato! Salt and pepper to taste while browning. Drop in the peppers when the chicken is almost finished browning, so they get a bit charred, too. Then add 2 cans of diced tomoatoes. I’m using the fire roasted with garlic variety. Stir the whole mess together well, and add a cup or two of broth, veggie or chicken. About 20 minutes before you want to serve, slice some squash, and add it to the sauce, making sure the squash is down in the liquid. 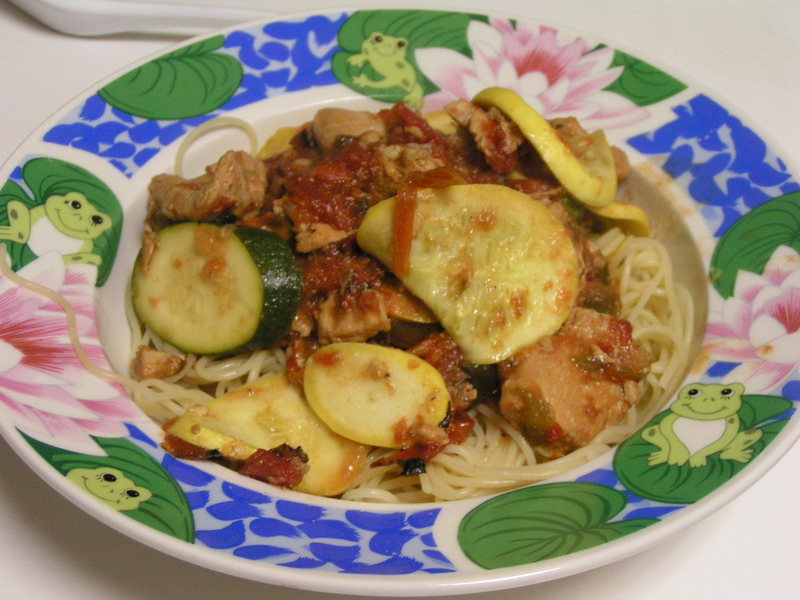 I used yellow squash and zucchini this time. 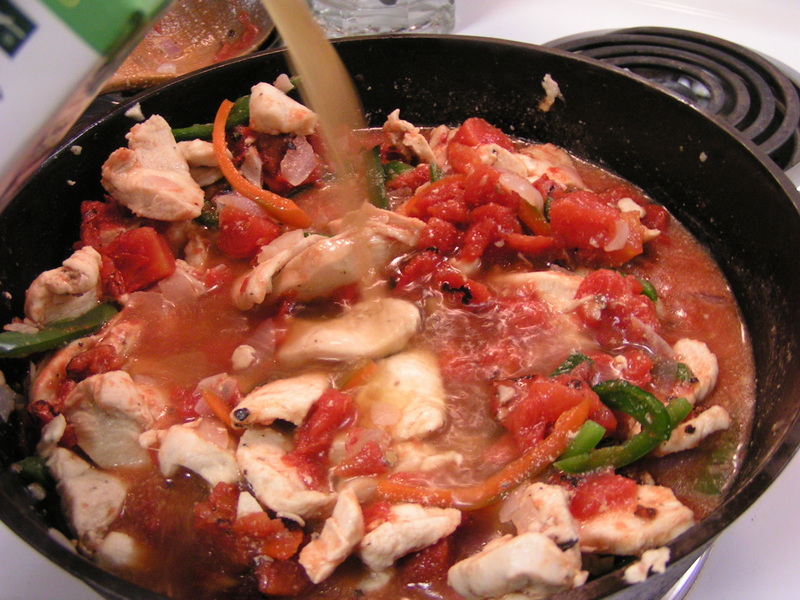 Stir in some tomato sauce, if you want thicker gravy. Previous Christmas Cake Next Caturday…with yoga! First, you did right by drinking the wine. 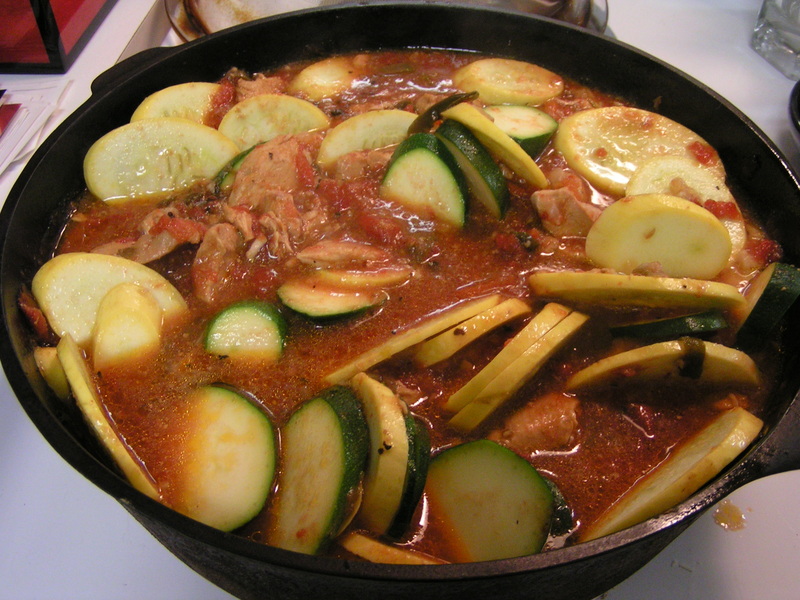 Second, I wonder if I can do this with cream of mushroom, instead, and yes, skipping the squash and zukes. Don’t judge me.